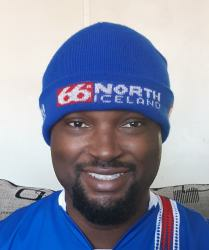 As Iceland prepare for their face-off with Nigeria, we asked a Kenyan Iceland supporter—sports consultant and commentator Arnold Kanyangonda—to tell us how his affair with the Icelandic national team came to be. I had never met one before. This was what first intrigued me about her, and drew me to her. Here in Nairobi—from and of another world that may well be a million miles away—was a living, breathing human being from that legendary land of fire, ice and Vikings; the land of Leif Eriksson and Eyjafjallajökull. The closest I had ever come to Iceland was flying past it, tens of thousands of feet aloft while traversing the two continents it straddles. Yet here now she was, as stunningly and strikingly beautiful as the island she came from, long, fiery hair swirling around her fairytale face, smile as bright and breathtaking as the glaciers of her homeland. The connection was instant, electric. It was as if we had known each other all our lives. Kindred spirits. Twin souls. We spent hours, days even, without seeing, thinking, or caring about anyone or anything else except each other. We fell in love quickly, deeply, fully. When she finally had to return home, we knew we had something special, and so kept it going despite the distance, and agreed to visit and meet her people and country as soon as I could. I have always championed the underdog, their triumphs over seemingly insurmountable odds inspiring and emboldening me to attempt the impossible since my earliest days. Heading into Euro 2016, Iceland was the ultimate underdog—the smallest country to ever qualify for a major tournament in the history of international football. And Eiður Guðjohnsen, for so long the first name on Iceland’s team sheet, but now past his prime, was now also an underdog, facing long odds to make it for the biggest occasion of his country’s sporting history. For many years, Eiður Smári, as she informed me he is known at home, was the one Icelandic player everyone knew, perhaps the most famous Icelander in the world, largely due to his exploits with Chelsea and Barcelona. He was cool, skillful, and decidedly otherworldly, embodying his homeland in his cold, calm efficiency on the pitch and cool personality off it. I liked Eiður. My friends and I called him ‘Badjohnsen’ because he was bad to defences. Now, however, it seemed Euro 2016 had come too late for the great man. And yet, like an aging warrior seeking one final chance at Valhalla, he somehow managed to get fighting fit in time to join the Viking horde making its way once more to Paris. Realising I wouldn’t make it to Iceland in time to share the tournament and the celebration with her and her people, she offered to buy and send me an Iceland shirt. My choice of name and number was obvious: Guðjohnsen, 22. The DHL package arrived on the day of the Hungary match. In my local pub, where she had once read a book while I watched a Kenyan Premier League match (she didn’t care much for football), I now unpacked and pulled on the shirt, to the bemusement—and amusement—of the barman and the DJ, both of whom remembered her, and who now both teased me for letting love blind me into thinking tiny Iceland would achieve anything in France. 90 minutes later, and after the 1-1 draw, they were staring agape at the ‘22’ on my back as I marched smugly home. I wore it when I joined my friends, who had heard of my supposed madness, for the Portugal match. “We shall smite Cristiano!” I declared, to laughs of derision all round. At the end of another 1-1 draw, they weren’t laughing. I had the shirt on as I coaxed and cajoled the staff in a tony lounge in the Nairobi CBD, where she and I had shared our first drink many months before, to tune in to the Austria match. And when Arnór Ingvi Traustason scored deep in stoppage time for the 2-1 win, when I leapt off my stool high into the air, as did 330,000 others far away in the mid-Atlantic, the waiters knew—as did I—that I truly loved this team. That August, I was finally able to get the month off I needed to visit her and Iceland. For two weeks, we travelled round the island, from Reykjavík to Akranes, to Dalvík for the fish festival, on to Snæfellsness, Mývatn, and all the way north to Akureyri, coming back via Grundarfjörður. She meant to show me as much of the beauty of her country as she could. And she did. Iceland is like another planet, the landscape, geysers, glaciers, mountains, hot springs, waterfalls and even clouds looking like something from an alien movie. It was the 30th country I had ever visited, and it was like nothing I had ever seen or experienced on five different continents. And never had I met such a warm, kind, generous people, with such a beautiful, collective heart. Everywhere I went, I was welcomed with open arms, greeted pleasantly and treated most wonderfully. The kind courtesy, genuine concern, and cheerful helpfulness I experienced will remain with me for the rest of my life, as I hope, will some of the friendships and connections I made during my time there. All the while, I was keenly aware that I looked and was different. It occurred to me that for many of the Icelanders I encountered, it might have been their first interaction with a Kenyan, an African, a black person—one of only a handful I saw in my time there. And yet not once did I experience anything but magnanimity, and was treated as a welcomed, honoured, and loved guest. A country’s football team is often a reflection of it’s people and culture. In Iceland, I found a culture of honesty and honour, humility and respect. The people are genuine and authentic, do not pretend to be what they aren’t or have what they do not. They accept what they are, where they are. They word hard with what little they have to eke out a life and living in places and situations that can be be brutally unforgiving. Iceland and Icelanders have a long history of doing so much with so little, of being prudent, resourceful and frugal. Most of all is an unwavering commitment to each other, helping and fighting with and for each other no matter what, ensuring they stand together or fall together—a strong spirit of collectiveness that I, whose own country’s motto literally translates as “Let’s pull together,” could only take in with awe and admiration. In so doing, they have built a functional, successful, prosperous country, with some of the happiest people on Earth, whose cheerfulness is as infectious as it ubiquitous. To watch and follow the Iceland National Team is to experience this most magical of lands distilled into football form. Now this brave, bold, brilliant band of brothers embarks on another international footballing adventure, in another land their seafaring forebearers once ravaged. This time, they’re there for the biggest prize in all of sport. And I stand, from thousands of miles away, with Iceland. I have pulled down the Eiður Smári jersey, defrosted some frozen hakarl, retrieved a bottle of Brennivín from storage, and found my 66° North beanie. I will proudly and happily have these every time Iceland plays in Russia 2018. And like their countrymen, I will cheer them on vociferously, support them wholeheartedly and love them unconditionally, regardless of how they perform. Follow Arnold on Twitter here. Read more about Iceland’s World Cup adventure here.